We all make silly mistakes and unforced errors when playing table tennis. But there is often a big difference between how players respond to making a mistake. Some players dwell on the mistake and start making lots more mistakes. Other players seem unaffected and bounce back stronger. How can we be more like the player who responds positively to mistakes? In this blog post I share a simple mental trick to help you react better when you make a mistake during a match. I have a player I coach who can do a training drill brilliantly nine times in a row. But on the tenth attempt, he messes up. He will then say out loud “I can’t do this”. I can see the self doubt in his facial expressions. His body becomes tense. And inevitably he will start making more mistakes. The same happens in a match. He will be playing well and winning. Then he makes a mistake and his self-doubting mind goes into overdrive. The grip tightens. The fear of losing increases. His game unravels. He loses the next few points. What causes this playing melt-down? Usually the answer is the mind. Or, more specifically, focusing the mind in counter-productive way. When this player makes a mistake, he will dwell on what he did wrong. His mind with flood with all the other times he has done it wrong. He will tell himself “I just can’t play this shot. I always mess it up”. His grip will tighten. His muscles tense up. His shots become rushed and jerky. And guess what? He messes up even more. All of the negative thinking becomes self-fulling. He tells himself he can’t do. He visualises other times he messed up. So he messes up again. This is actually quite common. Many players experience these feelings. But if this is something which happens to you, you need to do something about it. You need to switch your mindset. We all make mistakes, but mistakes don’t have to destroy your confidence. When you make a mistake in a match, pause for a moment. Very quickly analyse why you made the error, but don’t dwell it. Instead, visualise how the shot should be played. Fill your mind with examples of when you have played the shot correctly. Physically reenact how the shot should be played. Give yourself a brief positive instruction on what to do next time. I have bad habit of reaching forwards when attempting to play a backhand drive or backhand topspin. I am very aware of this. This habit often resurfaces in a match when the score is close. How do I deal with it? Firstly, I don’t get stressed. It’s no big deal. I pause and maybe walk away from the table. In a fairly detached way, I recognise I made the mistake by reaching forwards to the ball. I then start visualising how I want to play the shot – letting the ball come to me, keeping a loose wrist and elbow and snapping through the ball. If I want more positive reinforcement, I think about the times in matches I have played this shot well. I may even shadow play the shot, to remind my body of what to do. And I will give an instruction to myself to “wait for the ball, stay loose and snap”. All of this just takes a few seconds – the time available between points. The key to all of this is focusing the mind on how to do the shot you missed, rather than dwelling on what you did wrong. By focusing the mind in on how to play the shot, you increase the likelihood of actually doing the shot correctly the next time. You can use this approach in training sessions, competitive matches – every time you play. 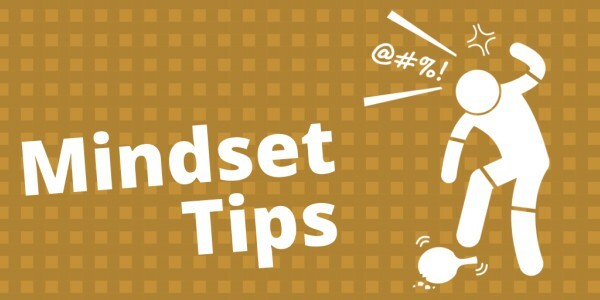 You can quickly teach your mind to respond to mistakes in a positive and productive way. Of course, this simple mental trick won’t solve all your problems and suddenly turn you into the best player in the world. But there is absolutely nothing to gain from having a negative, self-doubting mindset. This will get you nowhere. So give it a try. Respond positively to making mistakes. Believe in yourself. Show everyone how you can play table tennis! What if you are a mistake and you don’t know why, or you don’t know how to make a better shot next time? Good point. If you have no idea why you make a mistake, then you need to ask someone for feedback. This could be a more advanced player or a coach – someone who can explain how you should play the shot. Over time, you will develop a fuller knowledge of the game and a better understanding of how you should execute every shot.